From the back cover: "Food columnist Angie Amalfi has it all - brains, beauty, and a cooking talent that can tickle anyone's taste buds. 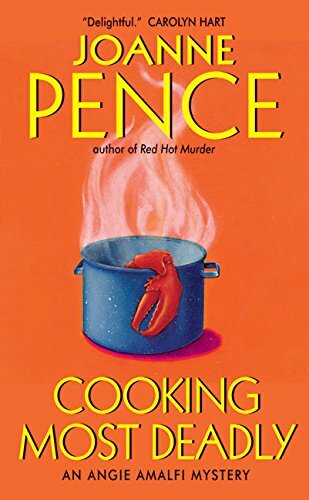 While she's wondering if it's time to cut the wedding cake with her deliciously handsome boyfriend detective Paavo Smith, he becomes obsessed with a grissly homicide that has claimed two female victims..."
This was a fun one that kept me guessing to the end. Released at the Rhizome Cafe at 317 E Broadway at the meet-up tonight. Picked up at Vancouver meetup. Picked this up at Vancouver meet up. The cover suggested it was a "fluffy" mystery, but it wasn't. Every once in a while there would be a bit of slapstick or farce, but in between the situation is serious and seriously dealt with. I did love the "Wings of an Angel" cafe and am still wondering how I could not have twigged to the source. Believing in Butch, Earl ("Oil"), and Vinnie is a bit difficult, but pleasurable. Enjoyed this very much.